The seminal, once and future improvising master, guitarist Derek Bailey, performs three nights in combination with a rotating cast: on Friday with saxophonist John Zorn, percussionist Ikue Mori and trombonist Jim Staley; on Saturday in a duo with drummer Susie Ibarra; and Sunday with Calvin Weston, drums & Jamaaladeen Tacuma, bass. 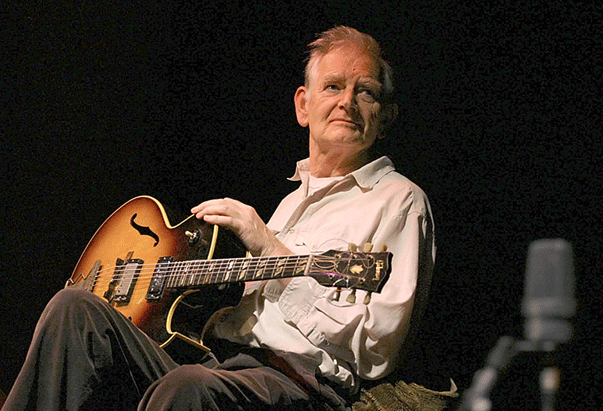 Derek Bailey’s music drew upon a vast array of resources, including indeterminany, rock & roll, and various world musics. The essential element of his work, however, is the type of spontaneous musical interrelation that evolved from the ’60s jazz avant-garde. Sound, not ideology, was Bailey’s medium. Bailey began playing conventional jazz and commercial music professionally in the ’50s. In the early ’60s, Bailey played in a trio called Joseph Holbrooke, with drummer Tony Oxley and bassist (and later renowned classical composer) Gavin Bryars. In the course of its existence, from 1963-1966, the group evolved from playing relatively traditional jazz with tempo and chord changes, to playing totally free. In 1966, Bailey moved to London; there, he formed a number of important musical associations with, among others, drummer John Stevens, saxophonist Evan Parker, trumpeter Kenny Wheeler, and bassist Dave Holland. This specific collection of players recorded as the Spontaneous Music Ensemble, which served as a crucible for the sort of egalitarian, collective improvisation that Bailey was to pursue from then on. In 1968, Bailey joined Oxley — another musician interested in new possibilities of sound generation — in whose sextet he remained until 1973. In 1970, Bailey formed the trio Iskra with bassist Barry Guy and trombonist Paul Rutherford. Also that year, Bailey started (with Parker and Oxley) the Incus record label, for which he would continue to record into the ’90s. In 1976, Bailey founded Company, a long-lived free improv ensemble with ever-shifting personnel, which has included, at various times, Anthony Braxton, Han Bennink, Steve Lacy, and George Lewis, among others.